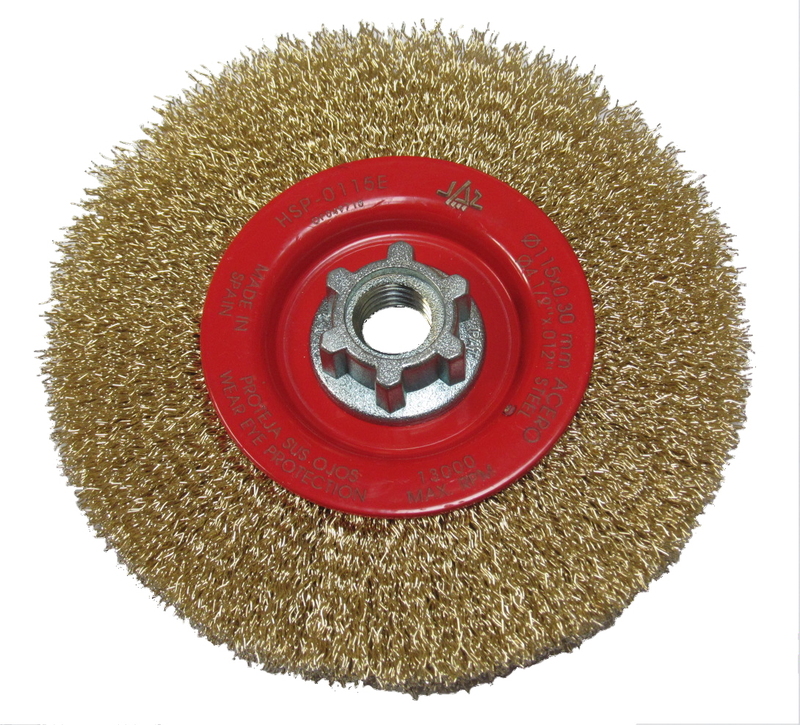 Applications: These wire wheel cup brushes are fitted with captive M14 nuts to fit standard angle grinders and variable speed metal polishing machines from 115mm upwards. 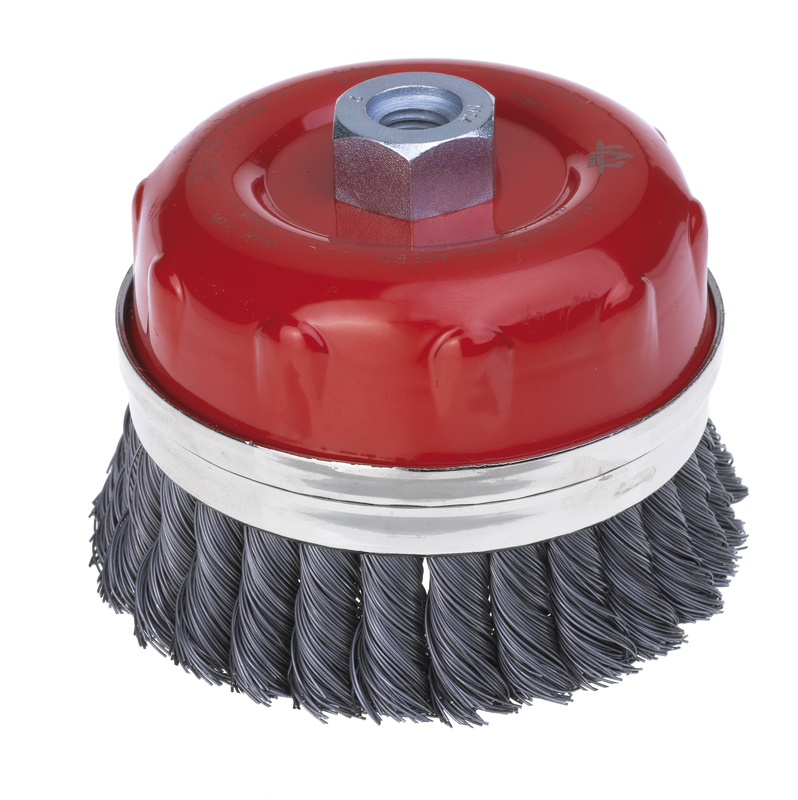 The twisted knot steel brushes are for applications requiring high aggression such as heavily rusted steel and welds. The crimped wire uses brass coated steel to give more controlled action for lighter coatings removal, cleaning etc. 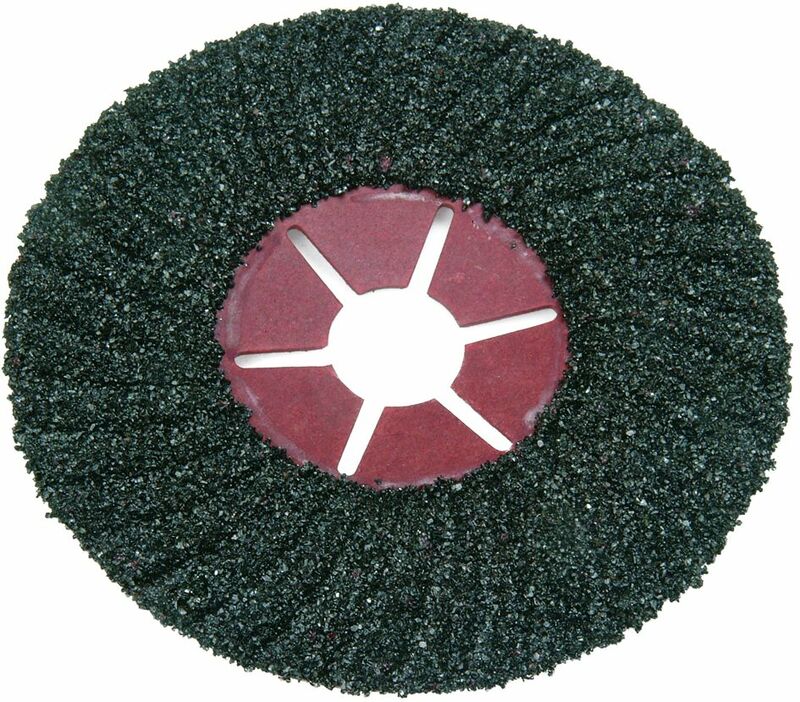 We stock the popular 60-65mm size and a larger 125mm diameter cup brush for 125 and 230mm angle grinders. 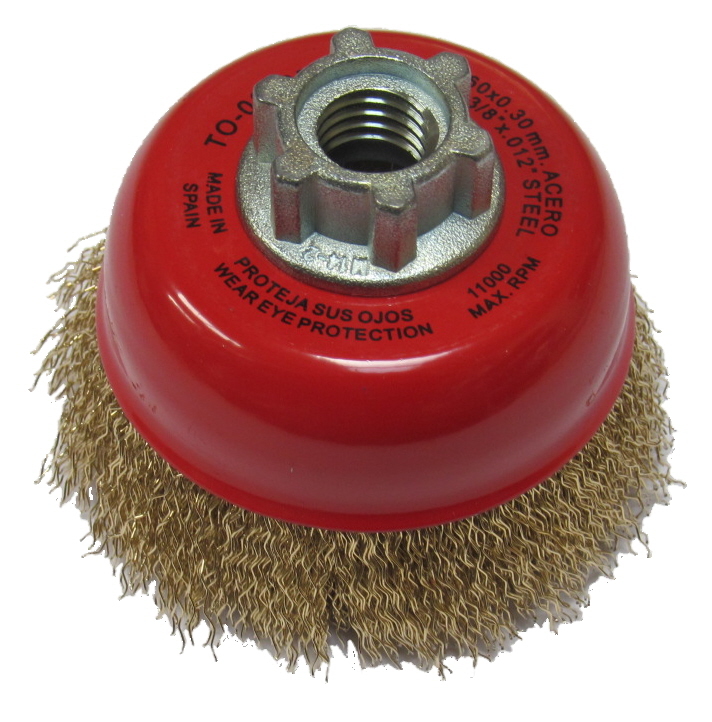 There is also an increased safety protected cup brush. This has a protection guard and a higher speed rating to minimise the incidence of broken wires flying off. M14 fitting to suit 115mm and larger machines. Twisted knot steel or brass coated crimped steel. Protective guard option on 100mm brush. Twisted Knot: 65mm 15,000rpm. 125mm 6,500rpm. Crimped Wire: 60mm 11,000rpm. 125mm 8,500rpm. Also Available: We also stock stainless steel wire cup brushes. 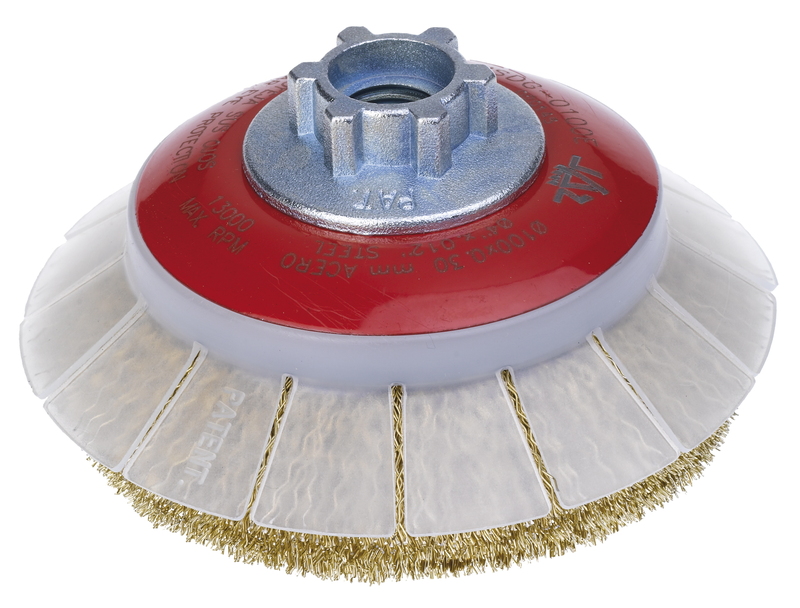 Strip Clean cup discs fit angle grinders and are used face down to strip large areas of paint and rust quickly. No backing pad needed. 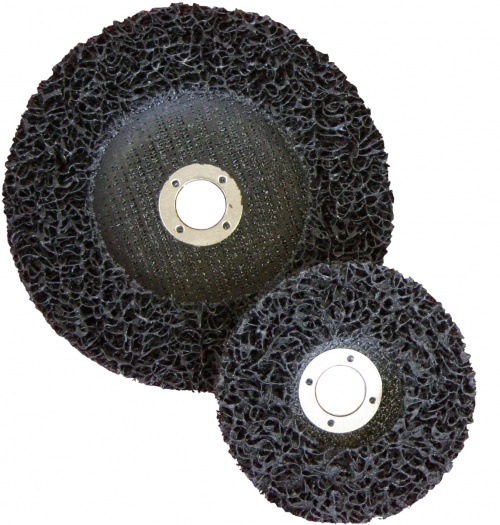 Heavy Duty Abrasive Discs are great for stripping coatings off concrete floors as well providing aggressive cleaning action on stone and brickwork. Stocked in extra coarse grade 16 or ultra-coarse grade 8. Semi-flexible discs are great for sanding masonry and concrete for light surface removal and cleaning, eg for graffiti removal or surface renewal. Grades 36 and 80 in stock. 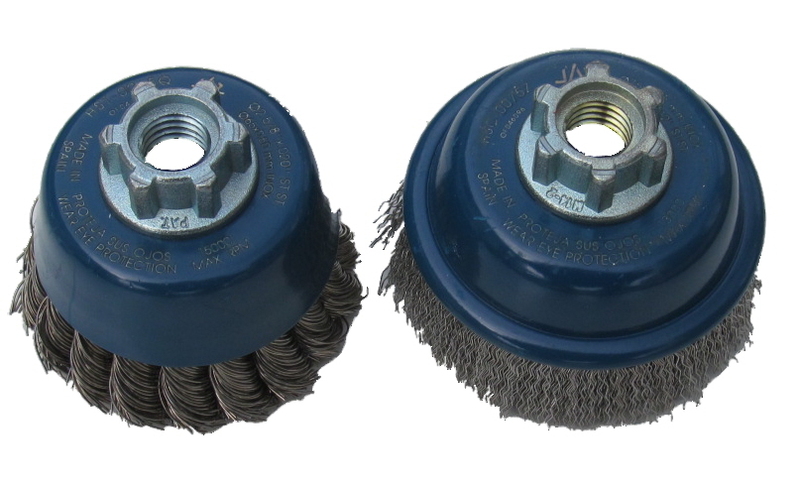 These cup brushes are stocked in both crimped and twisted knot stainless steel wire for use on angle grinders or metal polishers. 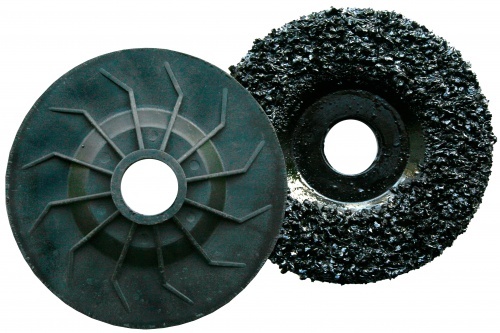 These wire brush wheels are designed for use on angle grinders.